At the end of January, when combing through the TBAC's latest quarterly refunding presentation, we highlighted what this critical advisory group highlighted as the key risks for the US Treasury market: namely i) the possibility of a significant financing gap over the next 10 years amounting to over $12 trillion and ii) the potential need for more domestic investor participation as foreign investor demand has been steadily declining in recent years. Specifically, the TBAC cautioned that the Treasury’s financing needs are expected to increase significantly even without factoring in recession possibilities over the next decade. The TBAC warned that deficits to the tune of $1-$1.5trn a year, and cumulatively over $12trn, over the next decade, are coming and will have to be funded in the bond market. This, of course, excludes the potential budget-busting impact of AOC's multi-trillion "Green New Deal." Meanwhile, as noted recently, the CBO stubbornly refuses to forecast a recession in the next decade, instead projecting a steady 1.5-2% real GDP growth over the next 10y. While the TBAC did not take a position on this laughable assumption, it warned that deficits typically rise 2-5% of GDP in recessions, which would translate to additional deficits of $0.5-1trn at current GDP levels, and warns that "these borrowing needs have to financed in the context of already high global dollar debt exposure." 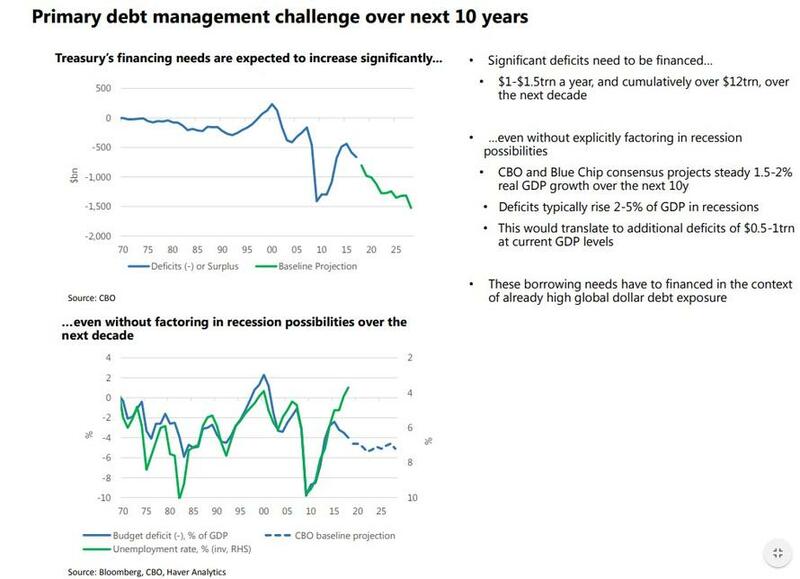 But the bigger problem is that in the context of soaring deficit funding needs, the TBAC was worried that "foreign investors already hold significant dollar debt" which is why the US will have to increasingly rely on domestic savings to fund its future budget deficits. The TBAC noted, tongue in cheek, that while the "USD is still the dominant reserve currency", reserve managers have been very gradually increasing allocation to other currencies, and that the USD share of FX reserves has steadily come down from 72% in 2000 to 62% now. It also pointed out that other countries with significant debt issuance needs (as a share of GDP) depend far more on domestic savings. As a result, "the Treasury should plan to meet financing needs more domestically than in the recent past." 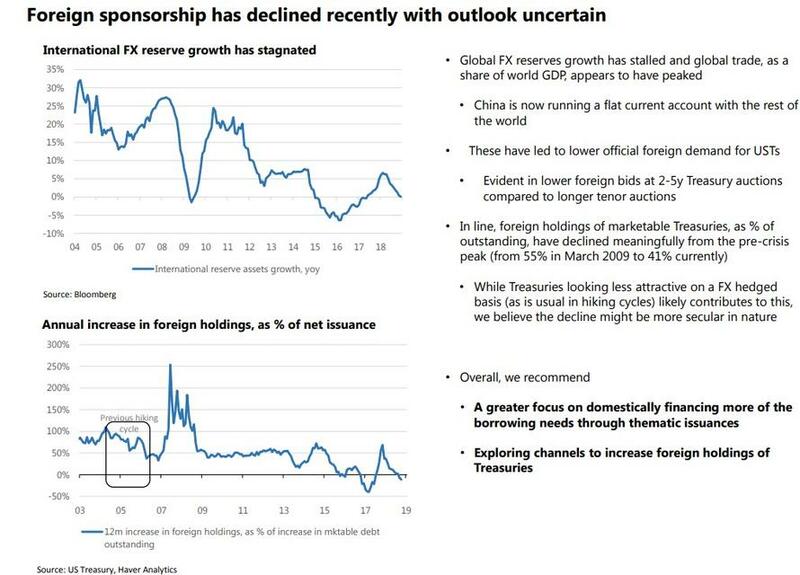 Even more concerning, the TBAC noted, is that global FX reserves growth has stalled and global trade, as a share of world GDP, appears to have peaked, while underscoring what may be the most important transition in the global economy in decades, namely that China is now running a flat current account with the rest of the world, something we discussed extensively in "A Tectonic Shift In China's Economy Has Largely Gone Unnoticed By Investors." As a result of these transformations, there has been an even lower official foreign demand for USTs, which has been evident in lower foreign bids at 2-5y Treasury auctions compared to longer tenor auctions. Furthermore, foreign holdings of marketable Treasuries, as % of outstanding, have declined meaningfully from the pre-crisis peak (from 55% in March 2009 to 41% currently). And while the TBAC admits that Treasuries look far less attractive on a FX hedged basis, something we also discussed recently, which is likely contributing to this decline in foreign demand, the TBAC believes "the decline might be more secular in nature." ... a domestic buyer had to step up to maintain orderly demand for US Treasurys. 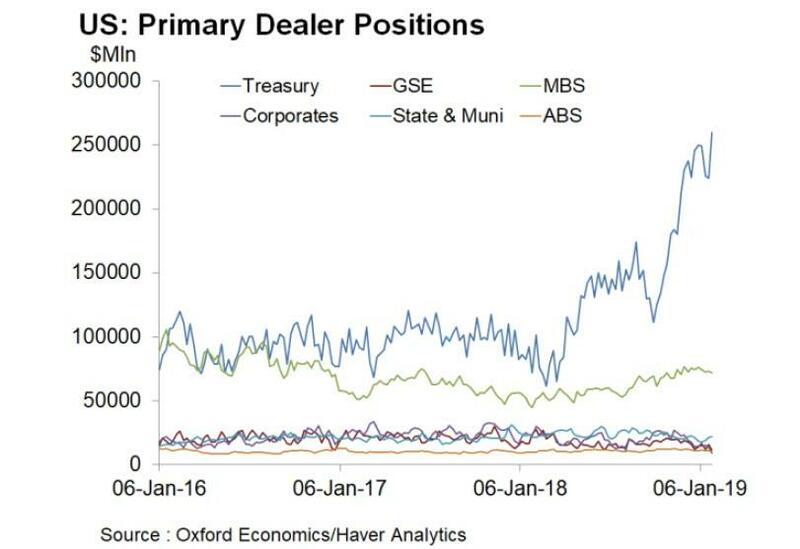 And a domestic buyer did: according to the latest New York Fed on primary dealer positions, there was a $25.8 billion surge in their overall average net long position in Treasuries, agencies, MBS, corporates, munis, and ABS to $$383.4 billion. That was the second largest combined net long position on record, behind only the $386.1 billion average during the week ended April 10, 2013, and a record in terms of just Treasury holdings. Of note, Primary Dealers' average net long Treasury position has rocketed higher since the beginning of October, and it leapt another $35.7 billion in Thursday's release to a record $259.3 billion. Holdings increased across the entire curve except for the very long-end, and there was also a jump in FRN holdings following the January 2-year FRN auction, but TIPS holdings were slightly smaller. 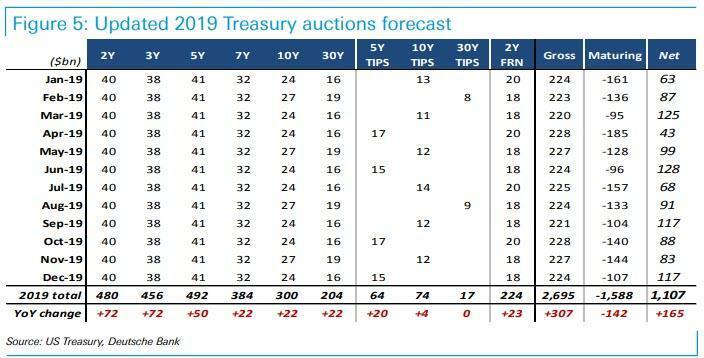 Some more details across various tenors: average primary dealer Treasury positions have generally been surging since March of last year, particularly in the front-end of the coupon curve, amid the deluge in new Treasury issuance and a lack of proportional increase foreign buyers. The front-end led holdings to new record highs in this week’s release. 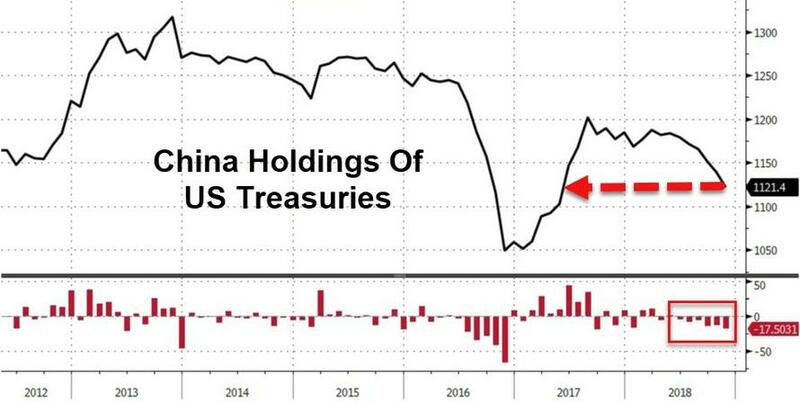 Treasury bill holdings had plunged from a high of $47.5 billion during the week ended December 5 to a low of $2.7 billion for the week ended January 16, but with Treasury raising more cash in recent bill auctions that surged $16.9 billion in this afternoon’s release to $27.4 billion. Average holdings of coupons maturing in less than 3-years jumped $6.0 billion to $87.3 billion, essentially matching the record high from December 2012. So what to make of this data? One explanation, a somewhat more benign one, is that Dealers are rushing into bonds anticipating further upside, which however would suggest that the "smartest money" is convinced that the US economic slowdown is set to accelerate, with deflationary consequences, resulting in even lower yields (i.e., the P&L angle). The more troubling conclusion is that as foreigners have failed, or refused, to match their buying of US paper to the ramp up in Treasury issuance over the past year in order to fund Trump's fiscal stimulus, Dealers - who are the failsafe bid to avoid a failed Treasury auction - have have no choice but to aggressively step up their purchases of US paper. If this is the case, this has potentially troubling consequences, especially for US monetary policy, because there will come a point where Dealers are limited as to how much more paper they can buy simply due to regulatory and capital requirement concerns. As such, should this buying spree continues and should foreign buyers refuse to accept the buying baton from Dealers, it will be up to the Fed to once again step in and begin monetizing US debt issuance. ... it is only a matter of time before the Fed not only ends its balance sheet unwind, but proceeds with QE4 in order to fund America's gaping budget deficit. However, whereas a new QE may be sufficient to monetize debt under normal conditions, it is unclear if even the Fed would be able to step up and monetize the tens of trillions in new debt that will have to be issued over the next few years should Ocasio-Cortez "Green New Deal" with its multi-trillion price tag, ever become a reality.